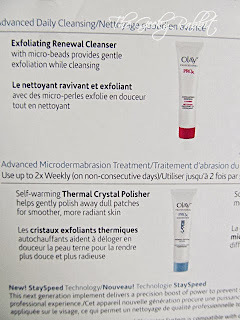 The Olay ProX Microdermabrasion + Advanced Cleansing System- such a mouthful to say! It's a nifty cleansing system as the name suggests. 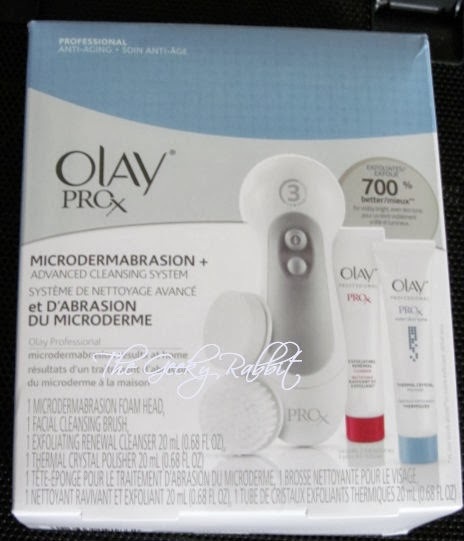 It's very similar to the older version of the Olay ProX kit, but this one comes with the Microdermabrasion brush head and Thermal Crystal Polisher. These two were the items in the kit that really drew me in. 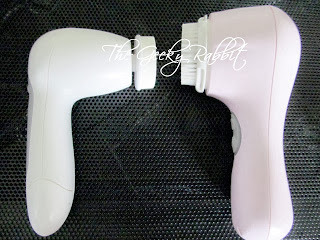 Here's a short review plus comparison with the Clarisonic Mia 2! 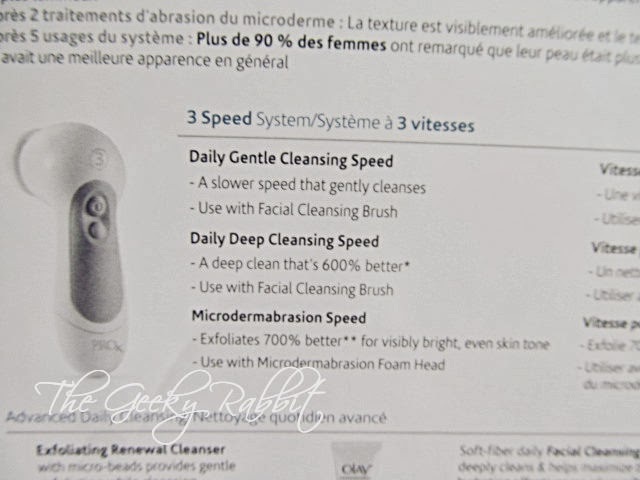 There are 3 cleaning speeds- 2 that are meant to be used with the normal brush head and one for microdermabrasion. The top button is to switch the device on/off and the bottom button toggles between the different speeds. 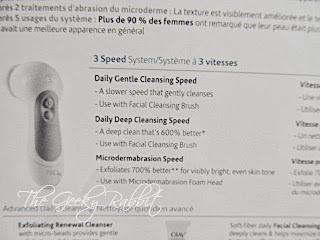 The speed stays the same even after the device is switched off- which is to say, if you turn the device off at the microdermabrasion speed, it will switch on at that speed. The speed does not get reset with power off. In addition, the brush head rotates- as opposed to the vibrating one in the Clarisonic. Based on my use, it's better to stick to lower speeds if you have very sensitive skin, or if there is any wound on the skin. Might hurt to use the higher speeds. The device runs on 2 AA batteries. Great for traveling, so that there's no charger to bring along. You can easily replace the battery anywhere. 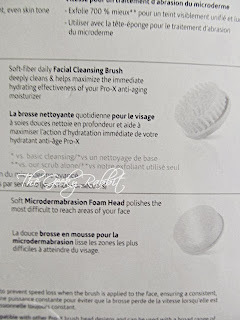 Comparison of the brush heads: right is Clarisonic, left is Olay. 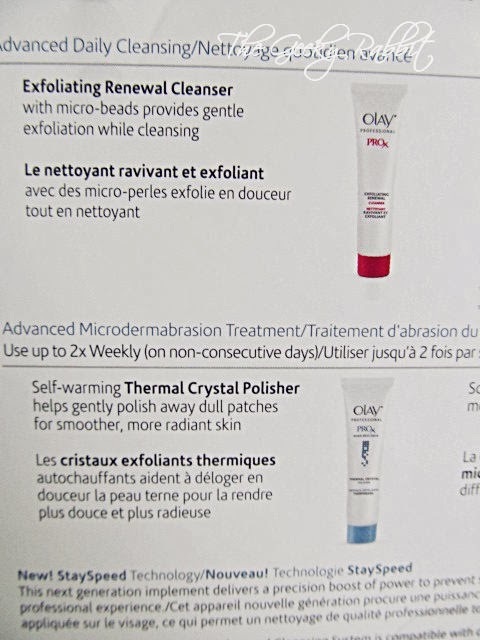 The Olay one is significantly smaller, and is made of one complete component. 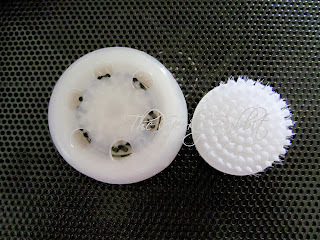 For the Clarisonic one, it comprises two pieces of concentric brush bristles and can 'wobble' with pressure or motion. 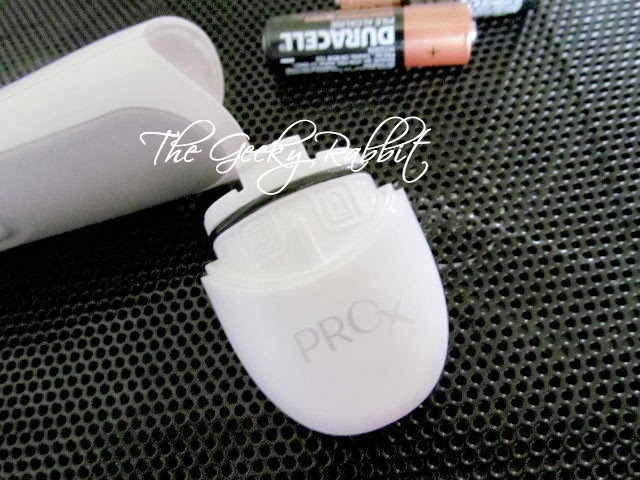 The handle for the ProX is much smaller than the Clarisonic Mia 2. The handle is shorter and slimmer. Ergonomics-wise, the Olay one is pretty easy to use and hold. 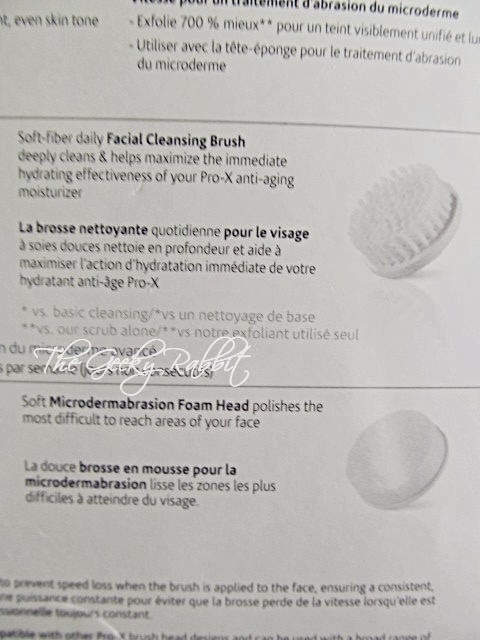 Above are some descriptions of the attachments and the cleansers that come with the kit. The kit does not come with any instructions on how to use the items, but I figured it's pretty intuitive and easy to handle. I love the different speeds, and the Microdermabrasion head does help to smoothen my skin. The effect is very obvious even after the first use. The price point of the kit is really great too, and the replacement heads are affordable. I think the brush head can last pretty long. The foam head seems to be eroded more quickly, so that is the one that should be replaced. It also gets a bit grimy if you have some leftover makeup (especially foundation- shows the most) on the face. I love how the warming effect of the Thermal Crystal Polisher. Really makes my skin feel luxurious after polishing! The smaller brush head makes it really easy to reach places between the nose bridge and at the side of the nose, so that is a major bonus. However, I do have some qualms about the kit. First, it does not come with any form of carrying case or protection for the brush head, which is a bummer for travelling. I probably have to scout around for a suitable box or case to stash the device in when I put it in my toiletries bag. Moreover, another issue I have is with the battery cover- it's really hard to remove! It took me a good long while to yank the cover off. I do think it might be made that way to prevent water from getting into the battery compartment, but the "press-and-pull" catch is really cumbersome to maneuver. Hopefully I don't have to replace the battery often, lest I have to open up the case again soon! Overall, this is a great product to try out and I always love Olay. Definitely worth a short and a cute addition to my skincare routine! At the affordable price point, I highly recommend it.